Yes, that's me in that photo. Twice so far this year I've joined these crazy people in Newcastle city centre and spent a couple of hours offering hugs to random strangers. From left to right you see Joanne, Andrew, Rob, myself, and Daniel. A great bunch of people, most of whom I've only ever met while holding "Free Hugs" signs. I'm looking forward to meeting them all again soon. I have an interesting relationship with hugs. Perhaps "interesting" isn't the right word. Mostly I'm not particularly keen on them. For the past few years I've been able to put this down to autism. Perhaps there's some truth in that. But lately I have begun to suspect that claiming my aversion is due solely to that autistic bit of neurology is passing the buck somewhat, and somewhat unfairly too. I think there are deeper issues to my hug aversion. I also strongly wonder whether my aversion has increased not as a result of anything innate but as a result of absorbing autistic traits I read off a list or researched in a book. A psychological osmosis. I am autistic. That's a given. But lately I've been asking myself whether I allowed myself to become more autistic by absorption from pictures of what autistic people are like, and if so, to what extent I have done that. I strongly suspect that I added or extended traits to my repertoire that weren't really my own. And I know that I am not alone in this self-suspicion - because I have been told the same kind of thing by some other autistic people. I also suspect that some of us, including those I know who share my self-suspicion, and quite unconsciously, have ended up using that as a handy excuse and end up more crushed by autism than lifted by a bit of extra self-knowledge. We don't intend to do this but we do it nonetheless. I even think back to my autism diagnostic procedure. Did I appear more autistic there just because I knew how autistic people were meant to present and think? Did I over-emphasise parts of myself? Was I giving a fair assessment of my own life history? And, since this is a blog post, have I been fair about these things when writing other posts? Have I allowed myself to be crushed by saying "I'm autistic" and lived a reality of my own creation? Due to other things going on in my life regarding mental health and a condition in which one of the traits is an "unclear and unstable self-concept" I have even asked myself whether I've formed a self-concept around autism and whether I'm not even autistic at all. The answer is no. I am autistic. And I know this without thinking about anything I may or may not have done since asking myself, "Am I autistic?" I know it because of the number of people, autistic and allistic, who spotted that I'm autistic before I ever began to look into it or accept the possibility. The earliest person I know of who knew for definite that I'm autistic concluded that in late 1993. She says it was completely obvious. So yes, I have no doubt that I'm autistic. I believe her. I believe other people too. Yet the question is still there. Did I become more autistic by absorption? I believe the answer to that question is yes. I doubt I'll ever know the extent of that but I certainly changed through learning about the condition. Some of that change was healthy. Some of it helped. I rather suspect that some of it wasn't healthy at all. Since reading about autism, and except with certain people, I've got a lot worse at hugging. Because autistic people aren't meant to like touch, aren't meant to want hugs. I didn't mean to get worse but somewhere subconsciously - and with my unstable self-concept - I got worse anyway. A part of me hung an identity on autism. Needlessly. I completely unintentionally added to myself from the autism checklist. I also discovered parts of myself that were already there but repressed. Working out which is which is going to take a while. I strongly wonder how many adult-diagnosed autistic people do something similar. I've been trying recently to overcome this particular hug aversion trait. I was never hug lover of the year but I didn't have the problems of the last few years. I remember back to my time in the Jesus Army. There was a lot of hugging. I dealt with that and it was okay. Through my life I'd never ordered people not to hug me. In the past few years I've done that and played my handy autism card. Some autistic people do need to play it. They've been severely hug averse since long before finding out that they're hug averse because of a condition. But me? I unintentionally used autism as an excuse. I think I've used it in quite a few areas too and unpicking reality from excuses is going to take some time. Sometimes the attempt at overcoming this trait or excuse has been difficult. Sometimes I still have to say a very firm "NO!" to hugs. But I'm getting better. Being out on the streets of Newcastle with the wonderful people in that picture is part of that process. I know by doing so I'm doing something that most people wouldn't do. 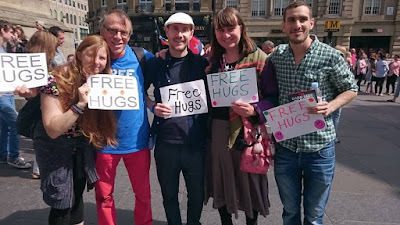 Even hug lovers wouldn't stand in a busy shopping area with a "Free Hugs" sign. Yesterday someone warned me to be careful if I did it because it's really dangerous and people might attack me. I don't like hugs much. But I can stand and hug strangers. And that means a great deal to me. Maybe hugs aren't so bad after all. Maybe I'll return to how I was before I ever read about touch aversion in autistic people. Maybe I'll progress further than that. I hope so. I'm autistic. But I can be a hugger too. Because so much of my touch aversion turns out to be a story I told myself. It's not real at all. And if I can be a hugger, what else can I be? What other autistic stories have I told myself that were never real at all? I'm good at telling myself stories and living them. The "I'm no good at social things" story is a classic false tale I told myself many times. It's time I stopped allowing stories to hold me back. Next time I'll talk more about the Free Hugs experience. I'll talk about people's reactions to us and about some of the people I spoke with last weekend while offering hugs. And next time you see me I give you permission to ask for a hug. I may still say no. But I might surprise both of us and give you a proper hug. I'm told I'm quite good at them! Very interesting. Thank you Clare for sharing your thoughts and your journey.